WEST LAFAYETTE, Ind. 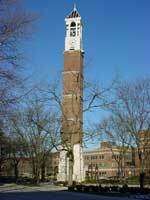 — Purdue University on Friday (Jan. 9) will test its bell tower loudspeaker system, which is designed to issue prerecorded emergency alerts to specific areas on campus. The message will be repeated four times and should be disregarded, Wright said. The pre-recorded emergency message will be played over the bell tower loudspeaker at 1:30pm on Friday. The message will be repeated four times. DISREGARD this message. The Purdue bell tower is located in the center of campus just off Centennial Mall Drive. The loudspeaker system was installed last spring to eventually become part of Purdue Alert, the university’s multilayered emergency notification system. A live voice message was tested over the loudspeaker in August and was able to be heard outside of buildings throughout the academic portion of campus. Since then, several messages relating to various types of emergencies have been recorded specific to 39 campus academic buildings. Emergency alert personnel can remotely activate a specific message via computer, and Friday’s test was set up to check for any flaws in the process. The bell tower’s system also has various siren tones that will be part of the test, Wright said. The tones should also be disregarded for Friday’s test. The bell tower on the Purdue University West Lafayette campus. Once the bell tower system is part of Purdue Alert, the siren tone with instructions will mean to seek shelter immediately. Voice notifications also will be used to direct individuals away from specific buildings, as appropriate. The voice notifications are primarily for individuals outdoors as the bell tower system is not designed to be heard in the buildings. In an actual emergency, the use of the sirens and loudspeaker would indicate a major disaster or imminent threat involving the entire campus and/or surrounding community. Friday’s test will help determine how soon the loudspeaker activation is added to Purdue’s emergency notifications system, Wright said. Other parts of Purdue Alert include the use of mass e-mail, Facebook, mass text-messaging, Boiler TV and the media. Depending upon the severity of the situation, some or all of the notifications could be utilized.